Now that the contest is finally over, it is time for Cemetech members to select a winner for the Air category. During the 10 day voting period, the contest judges will also be evaluating entries submitted throughout the entire contest in order to select the grand prize recipient. This game is a basic "shoot em' up" game, involving planes and missiles making things go boom. It gets increasingly difficult as you complete levels. This game was made for Cemetech Contest 20 in the air category. Please note: I do know that there are some graphical bugs, I only had 4 days to make this, so they will be fixed in the near future. It is still perfectly playable. Fly your drone to deliver packages from around the island to their destinations. Inspired by crazy taxi, drone racing, and drone package delivery, this small game has it all! This is my CC20: Transit Time air submission. I spent a very long time making this (over 120 hours) so I really hope you enjoy it. I created a YouTube video demonstrating the features (linked in README.txt), as well as an in-game introduction. The objective of the game is to gather as much wealth as possible (by buying planes and access to airports) while keeping your customers happy, all over 25 short days. Includes a high scores table, so try and beat your friends! Enjoy! Land as many loon-filled spacecraft on the moon as possible. 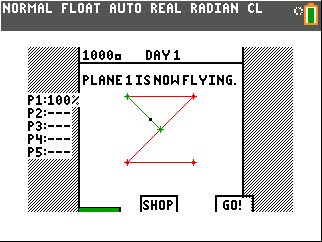 Floaty Cloud is a Flappy Bird spin-off for the TI-84 Plus CE. It was programmed for CC20 by dankcalculatorbro and requires c libraries. I am working to fully resolve this situation. I apologize for the mistake. It has now been corrected. Here's my take on this. I may seem a little harsh on some of these but just hear me out. I like the concept however, it seemed to lack way too many features. A few being: different enemies, a scoring system, and maybe Power UPs. Also although I don't want to imply that you are cheating or that your game isn't good. I'm wondering how this game got 4 votes with only 2 downloads. Are some people just voting for the first thing they see? I'm laughing at how derpy the drones arm is. Hilarious! Although the game doesn't actually function properly, there is no way to quit in-game, the hit-blocks are a little weird, you cant fly very high, and there is no sound. I feel like this would be a great game! I had a hard time finding the boxes but the navigation system to the drop-site is great! All the buildings looks pretty cool too. Good job! I think this program was probably the best calculator program that expressed the amount of effort that went into this. Although I found a few bugs (i.e. a missing 'Pause' when servicing airplanes, or planes can only be put in slots next to each other to work) overall I thought that the program ran very quick, and was chocked full of cool features. Again this was the only program with a Cesium icon, so bonus points there. Also I love the explosion graphics, it looks amazing! The game though, dang! This is harder than landing on the Mün! The control scheme is different that I was expecting but I think I like it better your way. Unfortunately, like the plain planes game, this just doesn't have many features. Once you get the controls down, it's fairly simple (it's only rocket science ) and just repetitive with no variables that makes it harder. Some ideas could be: Different weighted lander cans, or a "malfunction" resulting in different powered thrusters. This is pretty much flappy bird with an interesting twist, the obstacles move with you as you jump. I've never liked flappy bird but I still found this game enjoyable, especially the speed change. Personally the pre-set speed of 0450 is way to fast, I found my favorite to be between 1000-2500, if you go much higher it starts looking like the game is lagging. One suggestion (but I wont count against this program) is that I would have liked [2nd] as an alternative to using [Enter]. Still though, like most of the entries, after you get a feel for the program, it doesn't become that difficult However I like how you can change the speed the better you get. You're probably confused by this, it's not part of the contest list and you're right. As I've whined about in a few other threads, I turned in my entry too late. However I'm not putting this here to complain, since the file is already tagged with CC20 I want to describe the pros and cons to it and how people could learn from it. My entry's main focus was compatibility, Last competition I learned that not everyone updates their calculators so I went above and beyond and made my program compatible with all 83/84 calculators (color and monochrome). The point was to build your own craft, then depending on the width of your craft, the game would make different sized check points for you to fly through. It also took into consideration the height of your craft and would change the speed of the program accordingly. It also featured a scoring system, high score board, and a save/ loading system for your favorite crafts. (The save files are also compatible across all 83/84s). The main drawback was speed and a few bugs, the main one would consider that you missed a checkpoint if you weren't in the correct spot, even if the check point wasn't at the correct height yet. So what can people learn from this? At least for me, I love features, when I see a program that can do several different things I think "Wow, this developer must have really been passionate about this program." Games that only do a few simple things can get boring after a short time, and nobody wants to see in their review "this game was boring". So in conclusion, I have voted for _iPhoenix_'s since I believe that his program sported the most features out of all of entries. Congratulations! 1. Removed Plane mania bug 'getting 2000 coins' since this is actually intended. 2. Reviewed AHelpers program and submitted vote. Thanks for notifying me about the bugs in my game, I obviously played it before submitting it. It is my pleasure to announce that the winner of the CC20 Air realm is Cemetech member OldNewTimer! In "The Plain Plane Game," the player maneuvers an airplane while trying to shoot down the greatest possible number of enemy aircraft. The game features multiple levels with increasing difficulty. "The Plain Plane Game" can be downloaded from the Cemetech Archives. The grand prize winner will be announced within the next 24 hours. © Copyright 2000-2019 Cemetech & Christopher Mitchell :: Page Execution Time: 0.241597 seconds.